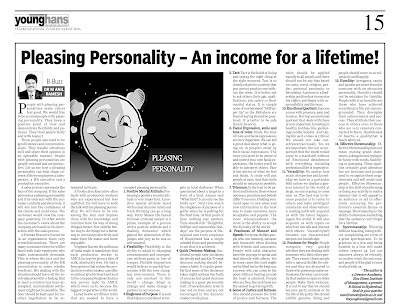 Pleasing Personality – An income for a lifetime! People with pleasing personalities make others feel good. We would like to be around people with pleasing personality. They keep a positive point of view and demonstrate flexibility and patience. They treat people fairly and with respect. These people also tend to be good listeners and conversationalists. They handle situations well and share their opinion in an agreeable manner. People with pleasing personalities are people-oriented and are interactive. Let us see how a pleasing personality can help shape careers of three employees: a salesperson, a HR executive and a production executive. A sales person represents the face of the company. If the sales person has a pleasing personality and if he interacts with the customer cordially and decisively, it will win him the confidence of his clients and yield sales. The customer would view the company positively. In other words the customer’s views about the company are based on his interaction with the sales person. A Human Resource Executive in an organization faces very stressful situations. There are many occasions where he will be faced with irate employees who make unreasonable demands. This is where the tact and the pleasing personality of the HR executive has to come into the forefront. His dealing with the situation should leave all the involved parties with a feeling that at least a solution has been attempted. An immediate settlement might not be possible. The door should be kept open for another negotiation to be attempted in future. A Production Executive often deals with production workers who are experienced but less qualified. He will have to walk the talk with his pleasing personality. He will have to be one among the men and impress them with his knowledge and convince how his way of doing things is better. Not only the better way to do things but a better way to increase productivity and make their life easier and more enjoyable. Verghese Kurien the milk man of India made it mandatory that each production worker at AMUL factory be given a litre of milk, absolutely free. He had a firm opinion that unless the production worker is taken care of he would not give his heart and soul to the company. Verghese Kurien was proven right by AMUL which went on to become the biggest cooperative in the world. Listed below are fifteen traits that are needed to have a rounded pleasing personality. 1.Positive Mental Attitude: Possessing a positive mental attitude is very important. A positive mental attitude faced with a clear decisive mind and fresh thinking can go a long way. Perry Mason the famed fictional criminal lawyer is a prime example of a person with a positive attitude and a dashing demeanor which gained the admiration of the judges and jury as he was so self-assured. 2 Flexibility: Flexibility is the ability to adapt to changing circumstances and emergencies without panic or loss of temper. Flexible disposition would help us to quickly harmonize with the ever changing environment. There is only one constant in this world – change. Adapt to change and make change a partner in our success. 3 Singleness of Purpose: It is said that Arjuna could shoot at targets in total darkness. When questioned about a target in a form of a bird, Arjuna said “What bird? I can only see the bird’s eye”. Next time watch the singleness of purpose of a golfer when he is putting for the final hole. At that point of time nothing else matters. Time stands still. “Delightful, fulfilled and memorable holidays” are the purpose of Disneyland and every employee of Disneyland has a single minded focus and personality to see that it is achieved. 4 Quick Decision-Making: Successful people take decisions decisively and quickly. Prompt decision making should become a habit. It is quite possible that some of the decisions taken might not bear the fruits of success, but quick decision making is a great personality trait. Procrastinators tend to lose out on time and are not encouraged in the dynamic modern work place. 5. Tact: Tact is the habit of doing and saying the right thing at the right moment. Tact is so closely related to courtesy that you cannot practice one without the other. It is better not to ask others their age, qualifications, job, salary or their marital status. It is simply none of our business! “Stiff upper lip” as the Britishers are fond of saying should be practiced. It is better to be safe than to be sorry. 6. Facial Expression, smile and tone of voice: Smile, the tone of voice and facial expressions are very important. We can tell a great deal about what is going on in people’s mind by their facial expressions. The more you learn to be aware of and control your own facial expressions, the better you’ll be able to interpret others. Face is the mirror of what we feel and think. A smile will put people at ease. And that smile should as natural as possible. 7. Tolerance. Is the trait to be patient and listen to those whose opinions, practices and beliefs differ from ours. Holding your mind open to new ideas and new information is the best way to make ourselves more acceptable and popular. The more tolerance shown the more is the ability to accept the diversity of the world. 8. Frankness of Manner and Speech. Everyone dislikes people who use cunning, sarcasm and innuendo when dealing with friends and associates. People with solid character have the courage to speak and deal directly with others. Yes in some cases this trait might not be liked but in the long run, a person who can come to the point without beating around the bush is admired. People who are free, fair and frank are the easiest to get along with. 9. Sense of Justice and fairness: One should possess the trait of justice and fairness. The rules should be applied equally to all people and there should not be any bias based on caste, creed, religion, gender, personal proximity or friendship. A person in a leadership position has to exercise his rights, privileges with responsibility and fairness. 10. Emotional Quotient: Success comes with pressure, pain and tension. Having an emotional quotient that deals with these is very important. Investing in healthy hobbies like gardening could be helpful. And taking life as it comes is critical. We should not take ourselves very seriously. Yes we are important. But not so important that the world would come to a standstill without us! Emotional detachment with everything including professional life is imperative. 11. Versatility: No matter how much of expertise and knowledge we have in a particular field unless we display a general interest in the world at large, no one is going to come near us. The best way to become popular is to listen to others and make intelligent comments and observations. A reading habit will acquaint us with the latest happenings in the world. It will also acquaint us with topics on which we can talk and interact with others. Versatility will broaden our character and deepen our knowledge. 12. Fondness for People: People recognize very quickly whether they are dealing with someone who likes other people. They resent those people with a natural dislike for others and they are attracted to those who possess genuine enthusiasm. Develop a personality that makes us open to other people. Make them welcome. It is not to say that we should become party animals or be the life of the party. We should exhibit genuine liking and people should come to us voluntarily and happily. 13. Humility: Arrogance, vanity and egoism are never found in someone with an attractive personality. Humility should not be mistaken for timidity. People with true humility are those who have achieved everything in life yet remain grounded. They downplay their achievements and success. They attribute their success to others even to those who are very remotely connected to them. Humbleness of heart is a quality that is much admired. 14. Effective Showmanship: Effective Showmanship does not mean making grand statements, joking around, trying to be funny with words, backbiting or gossiping. These qualities certainly grab attention but are tiresome and people tend to recognize these negative traits and will avoid such people. Effective Showmanship is the skill of performing or doing any activity in such a manner that it will appeal to an audience or aid in effectively conveying the performer’s essential theme or message. Showmanship is the ability to showcase something that the audience can’t forget for a lifetime. 15. Sportsmanship: Winning without boasting, losing without complaining are traits of a great sportsperson. To be gracious in a win and being humble in a loss will make others respect us. Let our manners always be friendly, no matter what the outcome, and people will be glad to have worked with us.